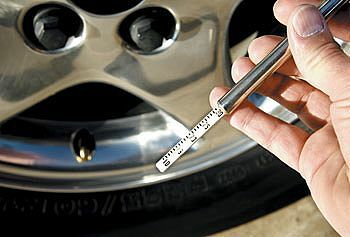 Checking and maintaining your cars tire pressure is an easy way to ensure it’s running efficiently. Not only that, it will help to reduce wear and tear, improve safety, improve gas mileage, saving you money in both gas and repairs over the life time of the vehicle. This might sound like it’s too good to be true, but I assure you it isn’t. Vehicle manufacturers started installing Tire Pressure Sensors in 2008, and according to the National Highway Traffic Safety Administration, these monitors have saved drivers $510 million dollars in fuel costs. These monitors will notify drivers when the tire pressure in any of their vehicle’s tires drops below 25% inflation. Even if you own a car with such a monitor, it’s still a good idea to know how to manually check and maintain your tire’s pressure yourself, since you can lose 3.3% total fuel efficiency with underinflated tires, and even a slight underinflation of 1 PSI can translate into lost fuel efficiency of 0.3%, according to the Department of Transportation. Just follow these easy steps. Before doing any work in or around a car be sure that the motor is turned off, the vehicle is in park and the parking break is on. 1. Unscrew the caps to the valve stems on all four tires. Be sure to place the valve caps in your pocket or somewhere else that is safe. They’re fairly small and can be easily lost. 2. Take your pressure gauge and press the opening onto the valve stem of the tire. As you compress the tire gauge onto the valve stem it’s common to hear a little air escape from the tire. Don’t worry about this, in most cases the amount lost in testing the pressure is negligible. Hold the pressure gauge down for 2-3 seconds and then release it completely from the valve stem. If you’ve done this properly the gauge should look similar to the one in the picture at the beginning of this tutorial. If you have a digital pressure gauge, a number should appear on the gauge’s display. 3. Take your reading and compare it against your car’s factory recommendations. The pressure gauge should be displaying a number, either digitally or on a sliding scale. Now open your driver side door and compare the number you have to what the factory recommends. This pressure will be displayed on a sticker inside the driver side door frame and/or in the owner’s manual. Note, that the front and rear tire pressures may be slightly different since the tires in the front of the vehicle help to support the weight of the engine. **it’s important to note that the recommended pressure listed on the tire itself is potentially going to be different than the tire pressure recommended for the car. Go with what is recommended for the car, not what’s listed on the tire. 4. Inflate! If you need to inflate the tire, you’ll do so using a foot pump or an air compressor. Either way, push the nozzle all the way down onto the tire stem of the tire that needs inflating. Inflate, and then periodically, take your gauge and check the tire’s pressure. If it’s still below the factory recommendation, repeat this process until it’s just right. 5. Once all the tires are filled to their appropriate levels, replace the stem caps. Be sure to put a cap on every tire’s valve stem. If not, debris from the road can get lodged into the valve stem and this will cause a continual slow leak. By now your car’s tires should be properly inflated and ready to go. If you’d like more ways to save money and be more efficient try implementing some of these tips for home energy efficiency, or give your home an energy efficiency makeover. Also, be sure to check out more of our green home improvement projects: Green Living Ideas, after all, it is a top 20 home improvement website! Photo courtesy of Williams Automotive Service and Volkswagen.